A few weeks ago, I made a a very special cake for a good friend’s birthday!! I tried to incorporate all of there favorite things, which included red velvet cake, funfetti sprinkles, and tons of Oreos!! The recipes used can be found below, and a full tutorial of this cake can be seen here. Mix together all dry ingredients (flour, cacao, baking powder, sugar, and salt) in a stand mixer with a paddle until fully combined. Pour in egg whites, and mix on low until just incorporated. Mix in the buttermilk in two installments, on a low speed. Add in vanilla, gel food coloring, and oil, and mix at a low speed until fully incorporated. Scrape down the sides of the bowl with a spatula, then beat on medium high for about 30 seconds. Gently fold in crushed Oreos. Divide evenly between prepared cake pans. Bake for 32-35 minutes, or until a skewer comes out clean. Allow to cool for 10 minutes, then run an offset spatula around perimeter of the pan to separate the cake from the pan. Place cake layers on a rack to finish cooling. Once the frosting is prepare, make the chocolate ganache. Heat heavy cream in a heat-proof bowl in the microwave for 45 seconds-1 minute, until bubbling. Gently pour chocolate chips into the heavy cream, making sure they are fully covered with cream. Allow mixture to sit for 2 minutes. Stir slowly until the cream and white chocolate are combined, then heat again for 20 seconds and stir. Repeat as necessary until all the chocolate bits are fully melted and incorporated. If it seems too thin or thick, you can add a touch more chocolate chips or heavy cream! The type of cream and chocolate that you use can affect the consistency, so feel free to adjust as needed. Pour into plastic squirt bottles. I like to put my ganache into plastic squirt bottles when decorating cakes! But you can also use a spoon to drizzle it over cakes. Extra ganache can be kept in the fridge for 2 weeks. Once the cake layers are fully cooled, assemble the cake. Stack and frost layers with buttercream. Apply a thin crumb coat, and chill the cake in freezer for 5 minutes. Once the crumb coat is firm to the touch, apply, a second, thicker coat of frosting. Smooth with a bench scrapper. If you want to see a full tutorial for how I get smooth sides on my cakes, you can click here. 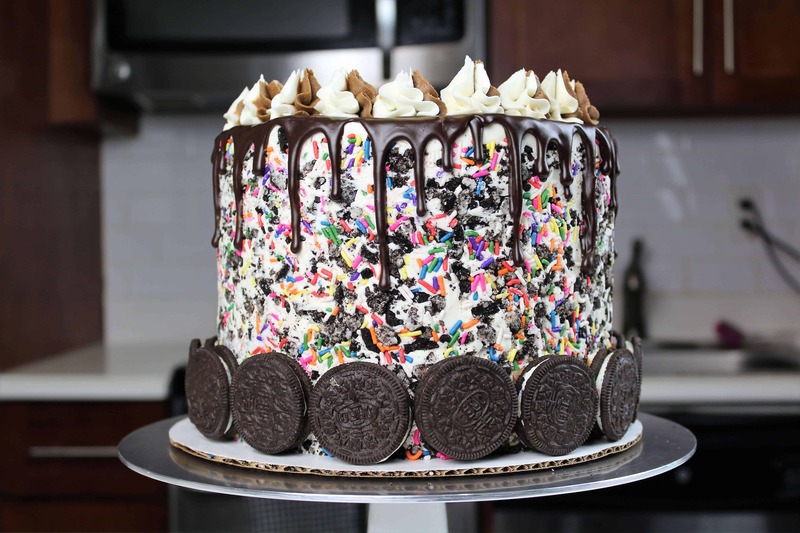 Gently press crushed oreos and sprinkles onto the sides of the cake. Smooth into frosting using an acetate sheet. Place cake in freezer for 15 minutes. Once the cake is fully chilled, use a squirt bottle to add the ganache drips. You can learn all the tips and tricks I use to add drips to a cake here. I also added some birthday cake oreos around the base of the cake, and piped some swirls onto the top using a Wilton 1M tip. Hi, I really enjoy your videos & I’m learning a lot. How do you prepare the cakes for freezing & for how long do you freeze them for before assembling the total cake layers with frosting? Do you use a special freezer or even your ordinary home freezer? Do they need to be on flat service in there? Could you put them in fridge instead or freezing is best? Please help! I would recommend the freezer over the fridge! the fridge can dry them out. I place mine in a large tupperwear container once they’re fulled cooled, and pop them into the freezer for up to a week. You can use them as soon as they’re full chilled though! I usually let mine sit out for about 20 minutes before I begin decorating / frosting. Hope that helps! This looks so amazing!! What changes would I need to make to do three 9 in cakes instead of four 8 inch? Nothing! I’m not sure what the final baking time would be, but it’d say 35-45 minutes. keep an eye on it and once a toothpick comes out clean (or with a few moist crumbs), you know it’s done! Hey! Do we have to add the Oreos in the red velvet mixture? Looks great! Really keen to make this. Was wondering if you could was to convert the measurements into grams?? Thank you. is it plain or self raising flour? How much red gel food coloring do you use for the batter? I add about 4 squirts, but it can vary based on the type of cocoa you’re using, and the brand of gel food coloring! This is probably a stupid question but what is cacao? Is it just unsweetened coco? 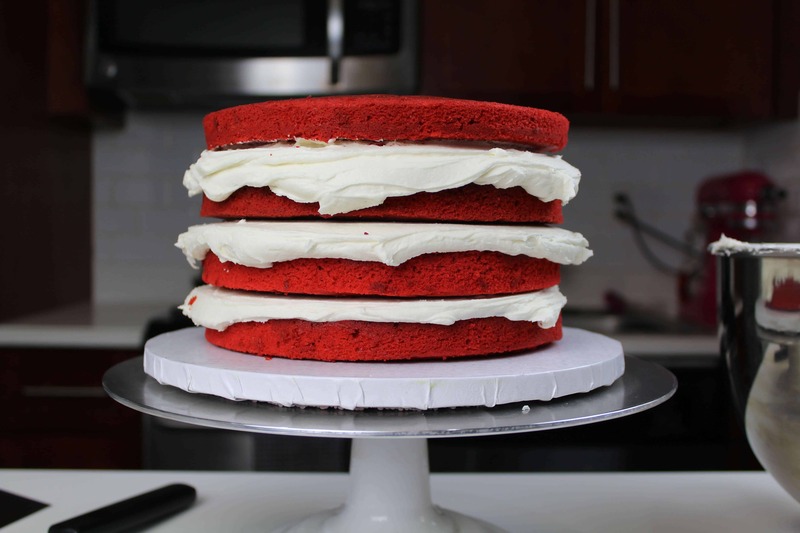 Your videos continue to teach me so much so thank you for sharing all your wonderful cake recipes – I’m incorporating this recipe in a two tier cake and this will be my top tier which is 6 inch cake pans – do I need to adjust the recipe at all ? I would like to know if I can use this recipe for cupcakes? And how many cupcake will it make? i wouldn’t recommend it! it bakes really flat, so it doesn’t make very good cupcakes! They also stick to the liners! Hi Chelsea! Do you think this cake recipe for the batter and icing would work for a bottom tier for a two tiered cake? If not, which of your cake recipes would you recommend? Thanks!! definitely! it’s pretty sturdy, and it’s a crusting buttercream so it should keep it’s shape well as long as the cake is properly supported! Hi, If I wanted to make a naked red velvet cake with vanilla buttercream frosting for an event would it be okay to be left out on a cake stand for 6 hours? For photos and speeches etc? Or what could I do to prolong it? the cake should be fine to sit out for several hours! The buttercream will crust and keep it’s shape, as long as it’s not too warm out! Hello! 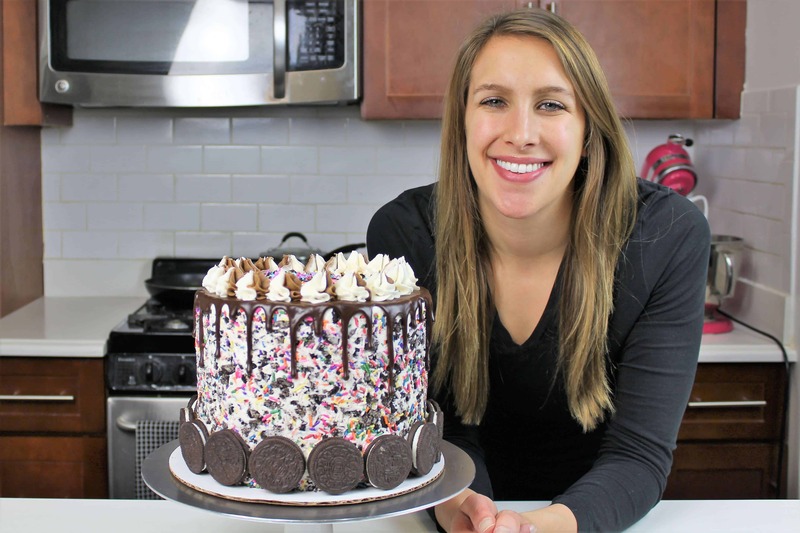 I want to make this cake for an upcoming party – but without Oreos. Could I substitute mini chocolate chips? Would that change anything else in the recipe? I was just wondering, if I have the Hershey’s Special Dark Cocoa Powder, should I still use 1/4 cup or less since it is a darker powder?